After a couple of years of surging stock markets, and several more of a general upwards trajectory since the international financial crisis, collective memory that equities markets don’t only go up appears to have entered foggy territory. Late January and early February saw the first bit of volatility in a while hit markets. 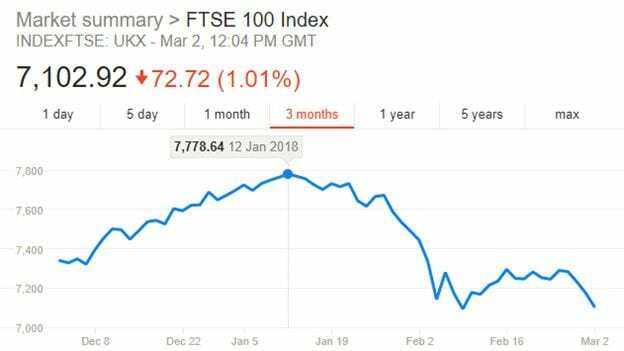 Here in the UK, the FTSE 100 dropped a little over 9% from its January 12th peak to February 9th bottom. A slight recovery since has again been erased over the past couple of days. Over on Wall Street, where recent gains have been even stronger, the S&P 500 benchmark index shed 10.7% over roughly the same period. The drops were largely welcomed, especially in the USA, as a healthy correction. The general opinion among market participants being that a little heat needed to be released from equities markets. Unless markets take a so far unanticipated more extreme downturn, what we’ve seen so far this year can be considered as a fairly benign correction and nothing more. However, the majority opinion among analysts is that equities, particularly across the pond, are currently on the expensive side. 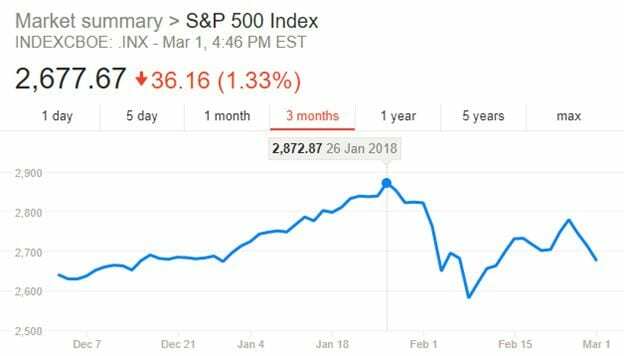 That heightens the probability of a more serious and longer term downward movement of the sort that could be defined as a ‘stock market crash’ in the foreseeable future. The FTSE 100 shed 50% over two years during the financial crisis. It may not happen, or at least not in the next few months or even this year. It simply means that the risk of one of several potential triggers causing markets to take fright, leading to a ‘crash’ is currently heightened. Despite the relatively modest nature of this year’s correction, a degree of panic and swept markets and haphazard selling was apparent. That provides further evidence that markets are currently vulnerable. Without in any way wishing to be doom mongers, there is a reasonable chance that a market crash, or more serious correction, could well be on the horizon. As such, it is only sensible for anyone with a stocks and shares ISA or any other form of investment portfolio to be preparing for that eventuality. The vast majority of stock investment guides do not focus on armouring a portfolio for a stock market crash. So what should you be doing in preparation for a crash within the context of heightened risk? The good news is, a major overhaul of an already well-balanced stocks and shares ISA portfolio is unlikely to be necessary. Historically, the statistical evidence demonstrates that coming out of a crash in the healthiest possible position to take advantage of the subsequent recovery that has always followed, is best achieved by remaining invested. Stay calm, accept that losses are inevitable over the shorter term and take steps to give yourself the best chance of the strongest possible portfolio bounce back when the storm clouds clear. Here’s our guide on how to do that. Stock market crashes hit hardest those who have been greediest during the good times. Of course, it is sensible to make hay for a stocks and shares ISA when the sun is shining. But if you try to make too much hay, the chances are high that it will still be out in the fields and ruined when the autumn rains come! Diversification: Diversification almost sounds like a cliché due to its permanent presence in every single stock market investing guide or checklist. However, the advice is there for a reason. Over the longer term, well diversified portfolios deliver better returns. It’s a statistical fact based on more historical data studies than you can shake a stick at! Growth stocks generate the best returns when times are good. Aggressive investors heavily weighted in this direction often crow about their returns, poo-pooing the more cautiously balanced portfolios for missing out. When things go bad, those returns are often wiped out because at least some of those growth stocks take losses so severe they never recover. Boring companies that offer steady, unspectacular returns also see their values hit during a crash, it’s the nature of a crash that the sell-off is indiscriminate. However, being built on solid foundations, the fundamental strength of such companies means they will almost always get back to where roughly where they were. Which is why successful investors put 70% or 80% of their capital into unadventurous income equities. That ratio can be compromised to an extent in the midst of a booming market but will always be adjusted back before doubts conditions may change start to creep in. Splitting a portfolio’s geographic exposure is also a fundamental rule to diversification. Putting 10% or 20% into riskier growth equities is enough to get some good upside when markets are charging ahead without exposing the portfolio to too much downside. Bonds, gold, property and infrastructure, usually bought through funds, should also be included, acting as the portfolios stabilisers. Hold Cash: Regardless of the situation in financial markets, retaining a cash buffer is advisable. Keeping enough cash to cover living expenses for 3-6 months should your usual source(s) of income unexpectedly stop means you won’t be forced to sell off investments that are generating good returns in positive market conditions. It also means cash is available to invest cheaply during market dips or downturns. Long Term Timeline: Don’t invest cash you expect to or might need to be liquid within a 3 to 5-year time horizon. If there is a crash and you need to access your capital within a couple of years, for example if you are due to retire, your portfolio may well not have time to recover its value and converting investments into cash will mean locking in losses. When, like now, the probability a stock market crash might happen increases, there are several steps that can be taken to readjust an investment portfolio in preparation. Increase Cash Allocation: holding more cash than the minimum sensible 3-months expenses when markets are booming will mean you miss out on returns you should reasonably expect to be reaping. However, as the probability of a downturn increases, the amount of a portfolio held in cash should be also be adjusted up. That cash can then be invested to great effect when markets are at or near to their bottom. Up Allocation to Resilient Income Stocks: there are some stocks and funds that have historically still managed to maintain dividend payments even during stock market crashes. Research companies and funds that fall into this category and gradually increase investment positions in them. More of these stocks and funds can be bought after a crash has already commenced as they tend to be unfairly undervalued along with everything else. Stay Invested: this has already been mentioned in passing but the most crucial way to survive a stock market crash with little to no longer term damage to your investment portfolio is to largely ignore it. If you have a balanced portfolio and have already increased your allocation to cash and resilient income assets, as hopefully you have, sit tight. Markets are cyclical and however bad things have ever become, within a few years they’ve always started to recover. The only thing selling will do is lock in losses – so don’t. Buy: if you want to profit from a stock market crash, start buying with that excess cash allocation you’ve set aside. The biggest gains stock markets see are usually during the recovery period after a crash. So if you invest wisely when everyone else is selling, you should be able to secure yourself some great bargains that will show strong capital gains when the market recovers. Don’t buy all at once on the assumption you can predict the bottom of the market but spread investments out over several months. This increases your chances of catching a as much of the bottom as possible.